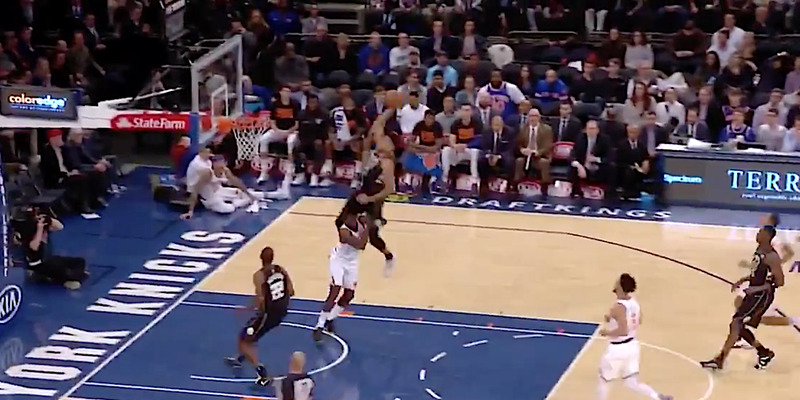 Giannis Antetokounmpo threw down an incredible alley-oop dunk vs. the New York Knicks. Antetokounmpo literally jumped over Knicks guard Hardaway Jr. to finish the play. Milwaukee Bucks forward Giannis Antetokounmpo showed off his incredible athleticism vs. the New York Knicks on Tuesday. On a two-on-one fastbreak, Antetokounmpo received a lob from Khris Middleton with only Knicks guard Tim Hardaway Jr. in the way. While players sometimes bulldoze one another on such plays, Antetokounmpo instead treated Hardaway like a hurdle, literally clearing him for a draw-dropping dunk. Again, that’s not hyperbole. Antetokounmpo actually jumped over Hardaway. On a night the Knicks lost Kristaps Porzingis to a scary-looking knee injury, they suffered another demoralising loss – Hardaway’s ego.